← Francis’ heterodoxy is now official. He has published his letters to the Argentine bishops in the ACTA APOSTOLICA SEDES making those letters magisterial documents. This week, the Vatican’s organ for promulgating the Official Acts of the Apostolic See, Acta Apostolicae Sedis (AAS), has published its October 2016 issue, containing Pope Francis’ infamous Letter to the Buenos Aires Bishops. 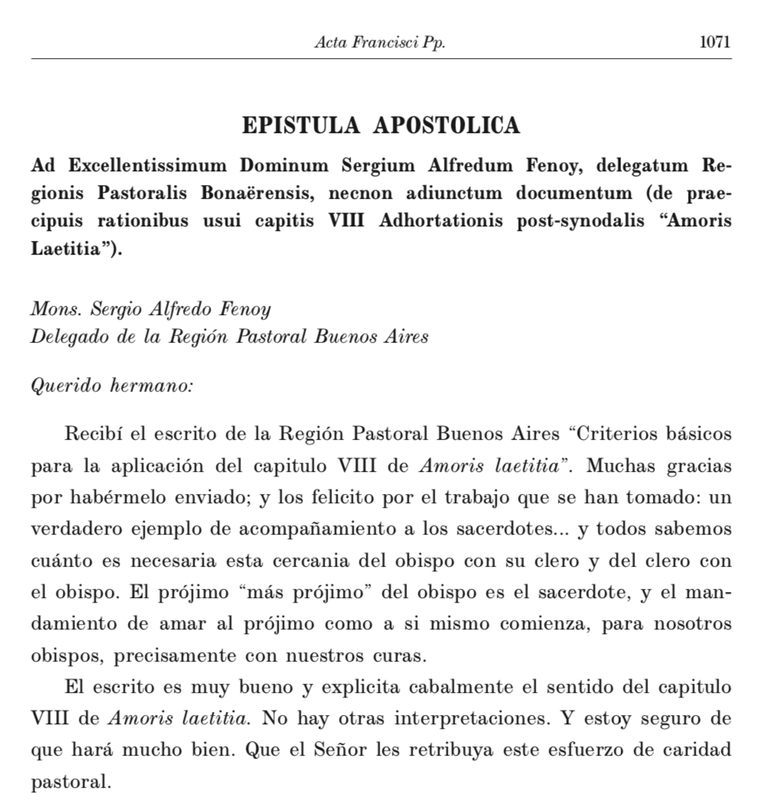 AAS not only published this letter, declaring that there are “no other interpretations” (“No hay otras interpretaciones”) of Amoris Laetitia other than those of the Buenos Aires bishops, but it also published the full Buenos Aires guidelines themselves, which permit Holy Communion in some cases for couples in a state of permanent and public adultery who are not committed to living in complete continence. Most significantly, AAS upgrades Pope Francis’ private letter to the Buenos Aires bishops to the official magisterial status of an “Apostolic Letter” (“Epistola Apostolica”) – AND it includes a special rescript as an addendum by Cardinal Pietro Parolin, Secretary of State. This rescript declares that Pope Francis expressly intends that BOTH documents – the pope’s letter and the Buenos Aires guidelines themselves- bear the character of his “authentic Magisterium”, and that the pope personally ordered their publication in AAS and on the Vatican website. The Catholic Encyclopedia defines a papal rescript as follows: “Rescripts are responses of the pope or a Sacred Congregation, in writing, to queries or petitions of individuals. Some rescripts concern the granting of favours; others the administration of justice, e.g. the interpretation of a law, the appointment of a judge.” Rescipts generally have the force of particular law, however, as in this case, only “when they interpret or promulgate a general law, are they of universal application.” Since papal rescripts answer an inquiry – could this rescript be a direct reply to the dubia of the Four Cardinals? Under Canon 8 § 1 of the 1983 Code of Canon Law, the AAS is the regular method by which “universal ecclesiastical laws” are to be promulgated: “Universal ecclesiastical laws are promulgated by publication in the official commentary Acta Apostolicae Sedis, unless some other manner of promulgation has been prescribed in particular cases.” While most papal documents appearing in AAS lack canonical or disciplinary force, the Pope’s rescript at the hand of Cardinal Parolin is clearly intended to give the Buenos Aires Guidelines a significant level of Magisterial authority in the interpretation of Amoris Laetitia. 6) In other, more complex circumstances, and when it is not possible to obtain a declaration of nullity, the aforementioned option [living in continence] may not, in fact, be feasible. Nonetheless, it is equally possible to undertake a journey of discernment. If one arrives at the recognition that, in a particular case, there are limitations that diminish responsibility and culpability (cf. 301-302), particularly when a person judges that he would fall into a subsequent fault by damaging the children of the new union, Amoris Laetitia opens up the possibility of access to the sacraments of Reconciliation and the Eucharist (cf. footnotes 336 and 351). These in turn dispose the person to continue maturing and growing with the aid of grace. The problem with Amoris Laetitia, it is clear, is not merely with “liberal bishops” who interpret it, but with the pope whose manifest interpretation of his own document is impossible to square with the perennial doctrine and discipline of the Catholic faith. See the October 2016 edition of the AAS on the Vatican website (very large pdf). See the Buenos Aires guidelines on the Vatican website here. Below is the excerpted portion of the AAS in its original published form.